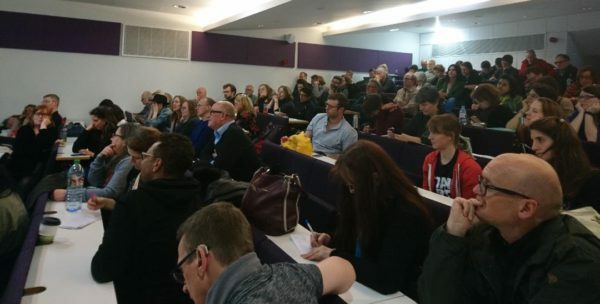 UCU Left | UCU Transformed day school: A great start! UCU Transformed day school: A great start! 150 delegates representing 54 colleges and universities attended the London Region hosted UCU Transformed activist day school. It was an inspiring day. Delegates discussed and debated how to continue the process of turning UCU into a democratic fighting union, building on the 14 days of strike action in defence of the USS pension scheme. Workshops ranged from social media, democratising the union and casualisation to equality and building solidarity. They were brim-full with interesting, imaginative and practical ideas about how to take the struggle forward. In two open sessions delegates broke into their sectors. In the sector sessions delegates discussed how to maintain the campaign in defence of post 16 education. In the HE session it was clear that the fight to defend the USS pension scheme is far from over with new campaigns which need to be developed. Delegates in both spoke about the need to open up new struggles over pay and casualisation. In FE there are already 21 colleges that have balloted for industrial action over pay and conditions. There are also a further 150 claims that have been submitted in 100 institutions. There is a real potential for second wave of industrial action in the colleges. The day-school heard from, and about, a number of universities and colleges such as Liverpool University, Southbank university, Lewisham and Southwark College and Bradford College and Hull College that are facing mass redundancy battles and made a clear call for whole movement to build solidarity with these campaigns. Amongst many delegates there was a profound anger and resentment about the way that the USS dispute was ended and sold short. This anger was directed at the leadership and especially the role played by the General Secretary. Delegates called for a more open and transparent union. Of course, passing motions to ensure that UCU’s rules allow members more control over disputes and that make the leadership more accountable are important. Late motions on pay and USS are being proposed for Congress and Sector conferences to build on the newly activated and invigorated membership of our union. But, ultimately, how much control the members have over disputes depends on the level of struggle. One of the most exciting developments of the USS dispute was the flowering of rank and file democracy; the mass meetings on picket lines, the strike committees that took control of the dispute at university level and the teach outs. These new and inclusive forms of democracy allowed members to have a real say in the direction of the dispute and were instrumental in stopping the first attempt by the leadership to put an end to it. Unfortunately, the second attempt vigorously championed by the General secretary succeeded in winning the majority of members in an e-consultation to accept the deal. These new structures did not run deep enough throughout the union to convince the majority that we can and must continue the strikes if we are to secure our victory. It was struggle they gave birth to these new democratic structures and it will be struggle that will maintain and deepen them. It is interesting to think about what might have been if we had entered the USS dispute with the level of organisation that we have now. 20,000 new members have joined UCU since the strikes in FE and HE started. The activists’ school was an important step in making sure that these new members don’t simply disappear and become inactive. The key to ensuring that the new structures and networks don’t wither and die is working out ways that we initiate new campaigns in defence of pay, pensions and casualisation. Delegates at the activists’ school made clear that these campaigns must be situated in the wider struggle against marketisation of the post 16 education sector with equality being central to all or demands. The employers in both sectors are not in a good shape. They are isolated and despised by staff and students alike. In HE we have not been defeated. It is the employers who are licking their wounds. We are angered by the fact that the leadership let the employers off the hook and allowed them to regroup. In FE the employers increasingly look out of touch and out of ideas about how to take the sector forward. It is not only the employers that find themselves in this position. The Tory government that are behind the market driven education polices are also despised by millions and riven with splits and acrimony. 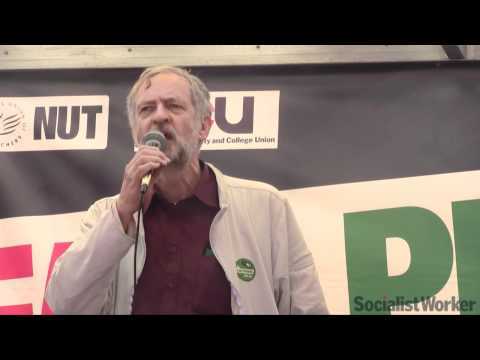 Jeremy Corbyn’s leadership of the Labour Party is positioned to assume office with a radical educational agenda. This is why it was important that yesterday’s activist gathering started to put forward ideas on how we can continue the defence of the sectors. The setting up of a UK wide solidarity network to ensure that we are sharing our ideas and experiences as they happen and the call for a recall conference in October can help this process to develop. Let’s see if between now and then we can build upon our successes and extend our networks to more colleges and universities. We are presented with real opportunities that have not existed for a very long time to succeed in building a real democratic fighting union. Launch of a national solidarity network to give impetus to national campaigns and solidarity to universities and colleges in struggle. End the democratic deficit. For a democratically controlled and openly accountable JEP. For national strike committees to control national disputes. For a campaign to force individual employers to commit to ‘no detriment’ to staff in any changes to the USS scheme on the Oxford model. For the launch of a national pay campaign in both sectors that wins ‘catch up’ covers the threat of increased USS contributions (HE) and tackles casualisation and the gender pay gap at a national level. To organise a recall conference in Autumn term.